Key Largo, FL – May 16, 2018 – Following three days of events in Key West, the 20th Afro Roots World Music Festival travels back up U.S. 1 to the Murray Nelson Center (102050 Overseas Hwy, Key Largo, FL 33037) for it’s final concert Saturday, June 2, 2018. 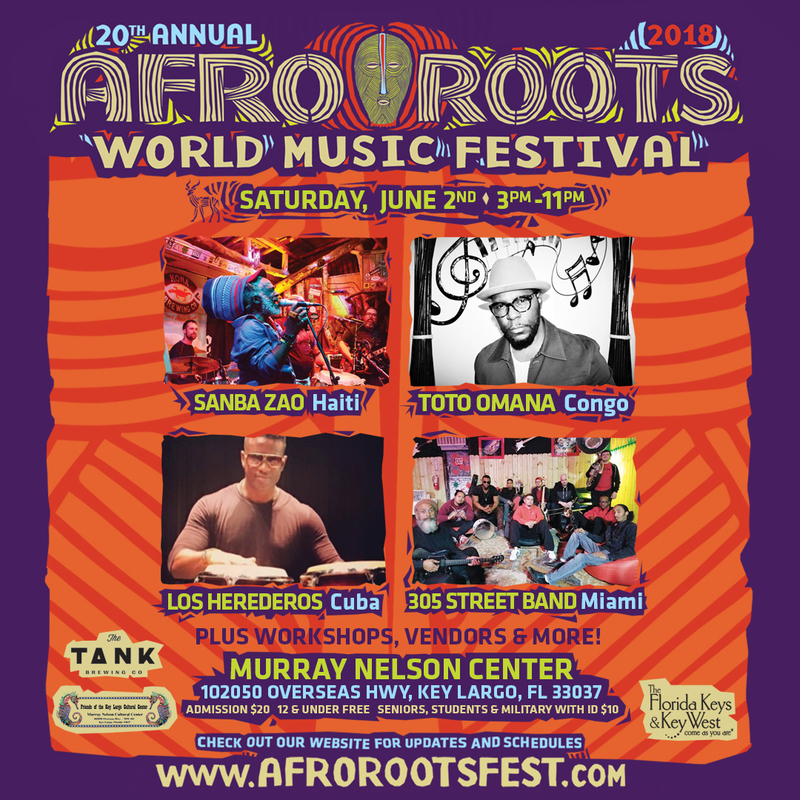 Live acts will include Sanba Zao(Haiti), Toto Omana (Congo), Los Herederos (Cuba) and the 305 Street Band (Miami). Tickets – available online at http://bit.ly/ARWMFKL – are $20, children 12 and under are free, and seniors, students and military personnel with ID are $10. Please note that the full price will be charged without ID at the door. The event runs 3 to 11 p.m.
“It’s been an amazing six-month celebration and we are excited about our final event in Key Largo,” says Jose Elias, founder and executive director of Community Arts and Culture (CAC). “Sanba Zao is a dynamic performer and it’s only fitting that he closes our show in Key Largo, being that he headlined our first show back in January in Jupiter.” Elias is a guitarist with the Spam Allstars, and plays the tres in his group Cortadito. He is also a producer and Grammy nominated musician and recording artist. Born Louis Lesly Marcelin, Sanba Zao is a master drummer and Haitian roots music legend. He is also a professor at L’Ecole National des Arts, Haiti’s national arts school, and has devoted his life to teaching and promoting the culture and music of Haiti. Marcelin runs an elementary school called the Bazilo Ecole Communautairei, which was one of the first to reopen after the 2010 earthquake that devastated his home country. Sanba Zao has also sings and tours with Lakou Mizik, and performed with other Haitian groups such as Group Sa, Foula Jazz, and Djakata. Toto Omana is a singer / songwriter / guitarist from Kinshasa, Republic of Congo. Influenced by Franco and OK Jazz, his music combines African Soukous with American R&B, funk, and soul. Toto speaks more than 12 languages, and sings in Swahili, Mandingo, English, Spanish, and French. Toto appeared as a guest on the Grammy-nominated group, Conjunto Progreso’s record Master Sessions Descarga & Son. He’ll release a full-length set on Afro Roots Recordings in 2019, which will be produced by Elias. Los Herederos, winners of the 2016 Miami New Times award for “Best Latin Band”, are the brainchild of Cuban percussionist and vocalist Philbert Almenteros. They perform in a very stripped down drum and chant format comprised of percussion-heavy rumba, guaguanco, and yambu numbers, which are all deeply rooted Afro-Cuban stylings. Philbert’s great grandmother was one of the founding members of the world-renowned Afro-Cuban folklore group Clave y Guaguanco. The 305 Street Band are a brass-heavy ensemble probably best known for their on-court performances with the NBA as the Miami HEAT Street Band. They perform pop, Latin, hip-hop, R&B, and everything in between, as well as dance to every song, performing intricate routines and even providing crowd interaction, from sing-a-longs, to limbos. The band is led by David Burgos, a trumpet player and member of another prominent Miami group, Elastic Bond. In addition to the live music performances, there will also be dance and percussion workshops earlier in the day for all age, as well as arts and crafts vendors, as well as food and beverages available for purchase. This 20th iteration of the festival, which is curated and by the non-profit organization CAC, features more than 50 international and local acts from all over the world, and is being held at venues from Jupiter to Key West. Brought to you by the Monroe County Tourism Development Council, and with the support of the Friends of the Key Largo Cultural Center and The Tank Brewing Company. 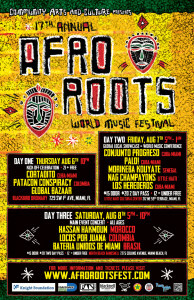 For more information, please visit www.AfroRootsFest.com or call 305.294.4641. This entry was posted in Blog and tagged afro roots, key largo, music festival, world music. Bookmark the permalink. 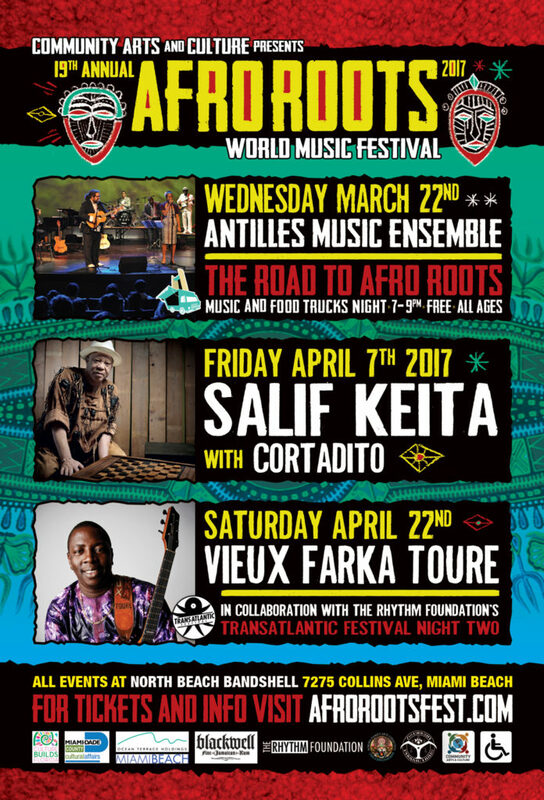 Islamorada, FL – April 10, 2018 – The Afro Roots World Music Festival travels to the Florida Keys for the first time in its 20-year history this month. 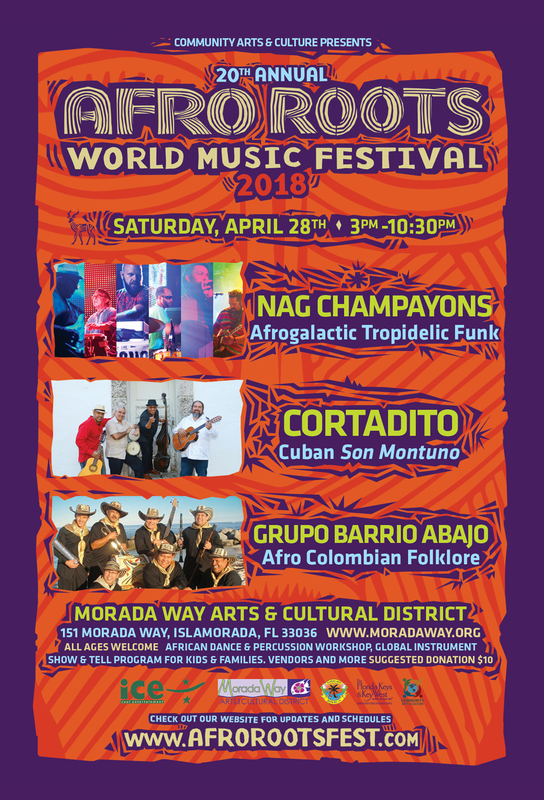 Islamorada’s Morada Bay Arts and Cultural District will be the scene of the celebration on Saturday, April 28, 2018, and will feature live music by the Nag Champayons, Cortadito, Grupo Barrio Abajo, and myriad family-friendly activities designed to enrich and entertain. The district is located at 151 Morada Way, Islamorada, FL 33036. Event is open to the public of all ages; suggested donation is $10. Miami’s Afro Galactic / Tropidelic funksters the Nag Champayons blend African, Caribbean and North American influences into a unique and extremely danceable sound. Cortadito specializes in performing Cuban Son Montunomusic similar to the Buena Vista Social Club, effectively transporting listeners back to a time when Trio Matamoros and Ignacio Piniero ruled the airwaves. Grupo Barrio Abajo aims to raise international awareness of the folkloric musical heritage of the Caribbean Colombia; styles such as cumbia, bullerengue, porro, chandé and more than thirty other unparalleled musical rhythms. This year’s edition of the festival, which is curated and run by the non-profit organization CAC, features more than 50 international and local acts from all over the world, in venues from Jupiter to Key West. Up next are two very special events scheduled for Key West May 17 through 19, and Key Largo on June 2. The event is being made possible through the generous support of the Florida Keys Tourism Development Council, Keys ICE (Islamorada Community Entertainment), the Morada Way Arts and Cultural District, and the Florida Keys Brewing Company. 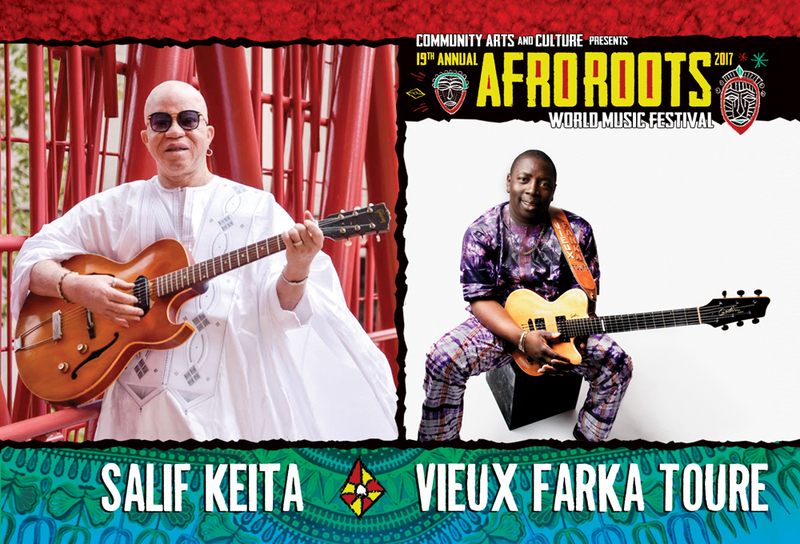 For more information, the full performer lineup and ticket links, please visit www.afrorootsfest.com or call 305.916.5521. This entry was posted in Blog and tagged afro roots, community arts and culture, florida keys, world music. Bookmark the permalink. Jupiter, FL – January 8, 2018 – Fine China may be the traditional 20th anniversary swag, but this year, Community Arts and Culture will be giving fans the gift of world music in three counties. The Afro Roots World Music Festival will launch its 20th edition Friday, January 26th at Guanabanas Island Restaurant & Bar (960 North Highway A1A, Jupiter, FL 33477), featuring two days of live world music. This year’s edition of the festival will feature more than 50 international and local acts from all over the world, in venues located as far south as Key West. 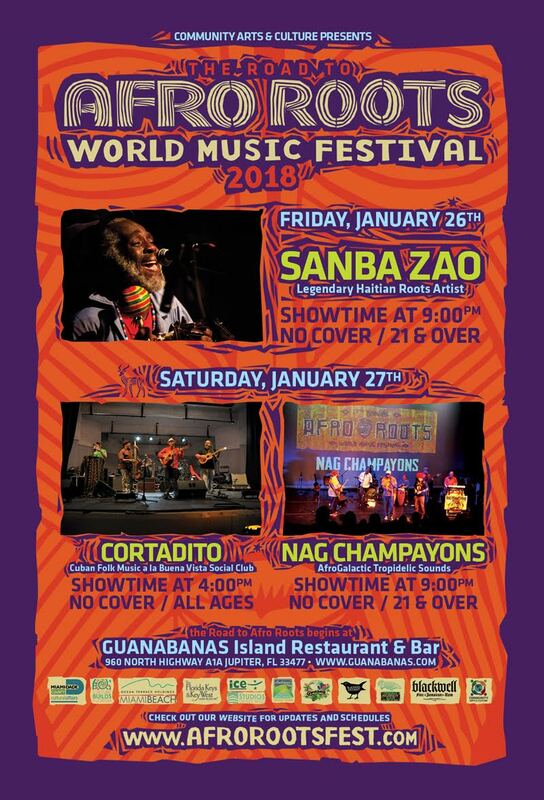 Haiti’s Sanba Zao will perform Friday, January 26, beginning at 9 p.m.; Cuban folkloric masters Cortadito plays 4 to 7 p.m. Saturday, January 27, with Miami’s Afrogalactic / Tropidelic funksters the Nag Champayons performing that same day at 9 p.m. All three performances are free and open to the public, with 21 and over welcome to the evening sets. 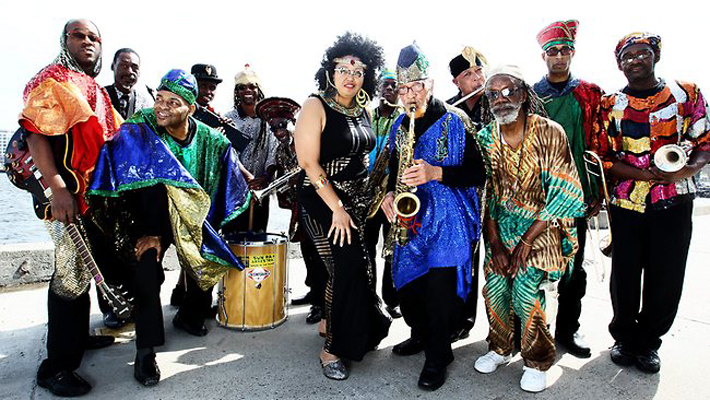 Named one of “South Florida’s Ten Best Music Festivals” by the Miami New Times in August, Afro Roots will also showcase Sun Ra Arkestra and Morikeba Kouyate April 7 at the Miami Beach Bandshell (tickets: bit.ly/2BtQdOq), Papaloko at the Studios of Key West on May 19, and more to be announced. “We’re excited about bringing the world music experience to our music fans here in the Jupiter area,” says Guanabanas talent buyer Matt Cahur. “Given the popularity of our Noche Latina series, the past successes of Cortadito and the Nags here at Guanabanas, and the always-positive reception to our roots and reggae events, I believe Afro Roots Fest will be a smash.” Cahur also heads Roots Music, Inc., a Jupiter-based, 20-year music management, production and promotions company. Master drummer and Haitian roots music legend Sanba Zao, born Louis Lesly Marcelin, is also a professor at L’Ecole National des Arts, Haiti’s national arts school. He has devoted his life to teaching and promoting the culture and music of Haiti, and to this end, runs an elementary school called the Bazilo Ecole Communautairei, which was one of the first to reopen after the devastating 2010 earthquake. Sanba Zao has also worked with Group Sa, Foula Jazz, and Djakata. Cortadito’s specialty is performing traditional Cuban music from the early 20th century. The group transports listeners back to a time when Trio Matamoros and Ignacio Piniero ruled the Cuban music world. They faithfully perform standards in the stylings known as Son Montuno, Guaracha, Bolero, Nengon, and Bolero Son. Cortadito is occasionally is backed by a variety of guest musicians, which gives the group a sound reminiscent of the Buena Vista Social Club. Learn more at https://www.facebook.com/Cortadito-295653443871468. The Nag Champayons are Miami’s standard bearers in terms of psychedelic music, showcasing their unique creativity, messaging and collaborative since their inception in 2003. A heady and infectious single “Brazilian LSD”, issued in 2016, came with a visually stunning video, and served as a follow up to 2015’s masterful Rising Sounds of a Sinking City, a darkly serious and ominous 21-minute environmentally-conscious theme. They continue to play local and regional music festivals, and are currently in the process of readying new music for release. For more details, visit www.NagChampayons.com. 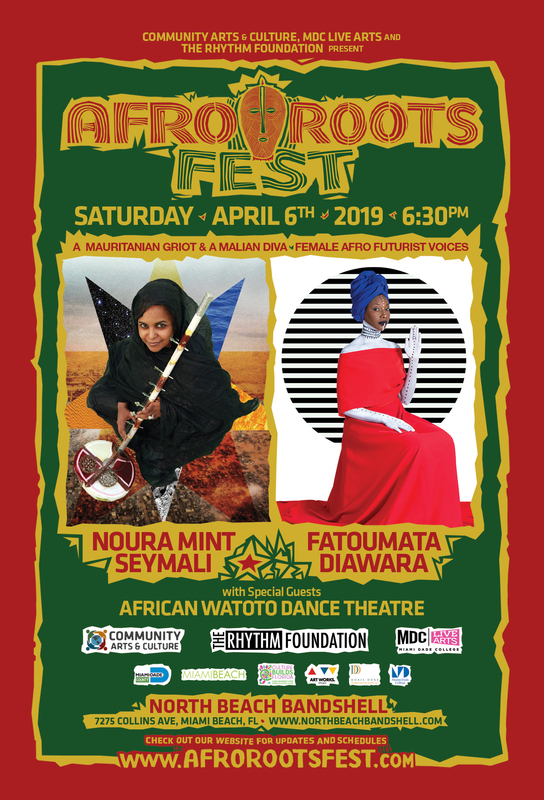 For more information, please visit www.afrorootsfest.com or call 786.218.6854. This entry was posted in Blog and tagged afro roots, community arts and culture, guanabanas, world music. Bookmark the permalink. July 15, 2015 – Miami, FL – The Miami-based non-profit organization Community Arts and Culture, dedicated to presenting the arts as a tool for education, is planning their biggest festival event ever. 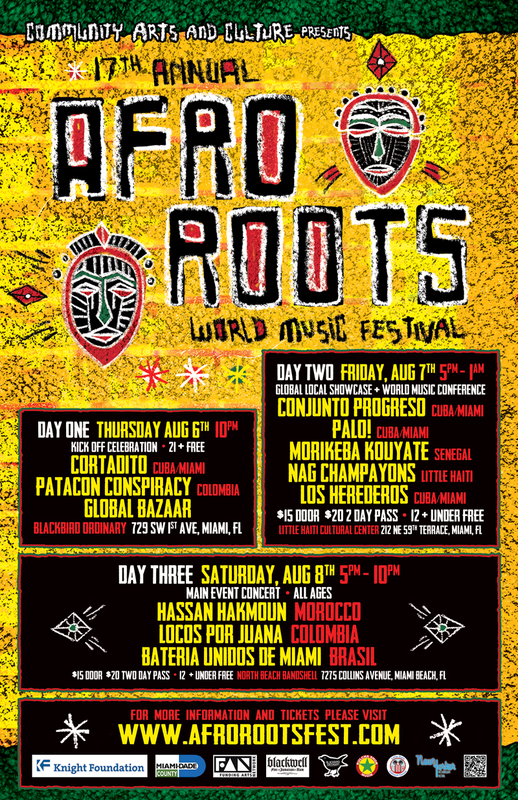 Taking place August 6 – 8, 2015, the 17th annual Afro Roots World Music Festival will launch with a kick-off celebration on Thursday, August 6th at Blackbird Ordinary (729 SW 1st Ave, Miami, FL 33130), continue with a World Music Conference and Global Locals Showcase on Friday, August 7th at the Little Haiti Cultural Center (212-260 NE 59th Terr, Miami, FL 33137), and wrap with a main event headliners concert on Saturday, August 8th at the North Beach Bandshell (7275 Collins Ave, Miami Beach, FL 33141). Celebrating the evolution of African culture by featuring some of the best performers from all over the Caribbean, the Americas and Africa, the festival’s opening event will feature music by Cortadito (Cuba / Miami) and Patacon Conspiracy (Colombia) along with a global bazaar. Day two at the LHCC includes showcase performances byConjunto Progreso (Cuba / Miami), PALO! (Cuba / Miami), Morikeba Kouyate(Senegal), the Nag Champayons (Little Haiti) and Los Herederos (Cuba / Miami), plus DJ Moses spinning global selections. Day three on Miami Beach will conclude the festival with headliners Hassan Hakmoun (Morocco), Locos Por Juana (Colombia) and Bateria Unidos de Miami (Brazil), along with DJ Le Spam. Day two’s World Music Conference and Global Locals Showcase is the festival’s most recent undertaking. The conference will feature three highly-informative panel discussions focusing on the business of world music; such as how to build an effective management, publishing and publicity team, what artists need to know about booking agents and touring, and more. Speakers and panelists will include Dmitri Vietze (CEO / founder of Rock Paper Scissors, Inc.), Isabel Soffer (co-founder / co-director of Globalfest), Deirdre Valente (Lisa Booth Management), Cary Sullivan (producer, Airtel Music Express / booking agent, Afro Funke), Gustavo Fernandez (CEO, Delanuca Music Group, president, BVE 45), and Janice Bond (cultural curator | arts advocate). Workshops will focus on North and West African traditions and Afro-Cuban folklore. This year’s main festival headliner Hassan Hakmoun will present a lecture on the traditional sounds and culture of the Gnawa people of Marrakesh, and demonstrate his main instrument the sintir, a three-stringed lute with a body made of camel skin stretched over nutwood. Master percussionists Roman Diaz and Mauricio Herreraand multi-instrumentalist Onel Mulet will demonstrate the application of traditional Afro-Cuban based folkloric music in the context of modern or contemporary music. 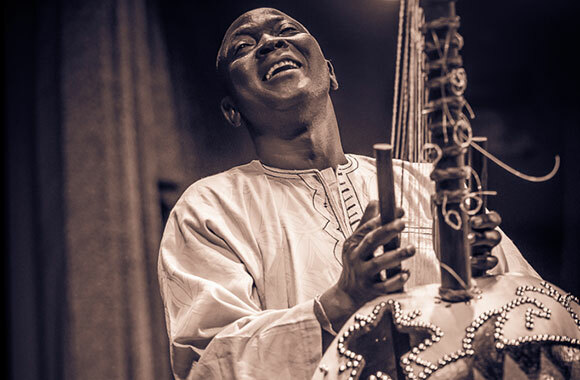 Senegalese percussionist Aly Mbaye and Morikeba Kouyate on the kora will show attendees the rhythms of the sabar drum and djembe, as related to the Mandingo musical traditions of Senegal, West Africa. Delou Africa Inc., a locally based non-profit organization that presents the annual African Diaspora Dance & Drum Festival of Florida, will be hosting a West African dance workshop with a live percussion ensemble. A special after-party will take place Saturday, August 8 at Naomi’s Garden Vibes Restaurant (650 NW 71st St, Miami, FL 33150), beginning at 10 p.m. featuring DJ Lance – O and the Kulcha Shok crew. There will be a $5 cover charge and the event is open to those 21 and over. 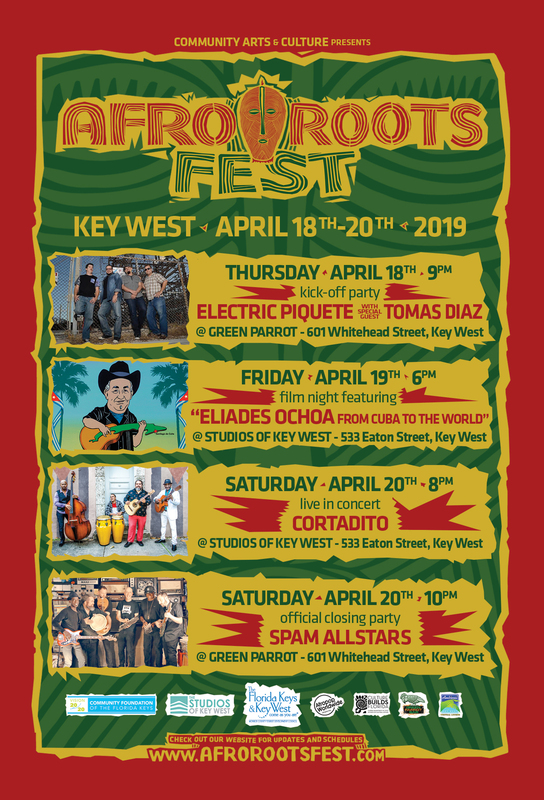 Support for the Afro Roots World Music Festival is made possible the KnightFoundation, the Funding Arts Network, the Miami-Dade Department of Cultural Affairs, the Little Haiti Cultural Complex, Blackbird Ordinary, the New Yorker Hotel, Kulcha Shok Musik and Blackwell Rum. 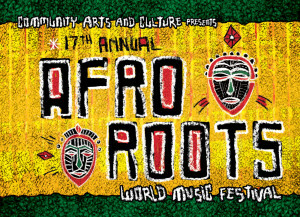 For more information, visit www.AfroRootsFest.com or contact 786.218.6854 |cacblogspot@gmail.com. This entry was posted in Uncategorized and tagged afro roots, live music, music business, world music. Bookmark the permalink. Who: Community Arts and Culture, a Miami-based non-profit organization that fosters an appreciation and understanding of a vast assortment of arts and cultures by educating individuals of all ages and social backgrounds through workshops, lectures and artistic performances in local communities. 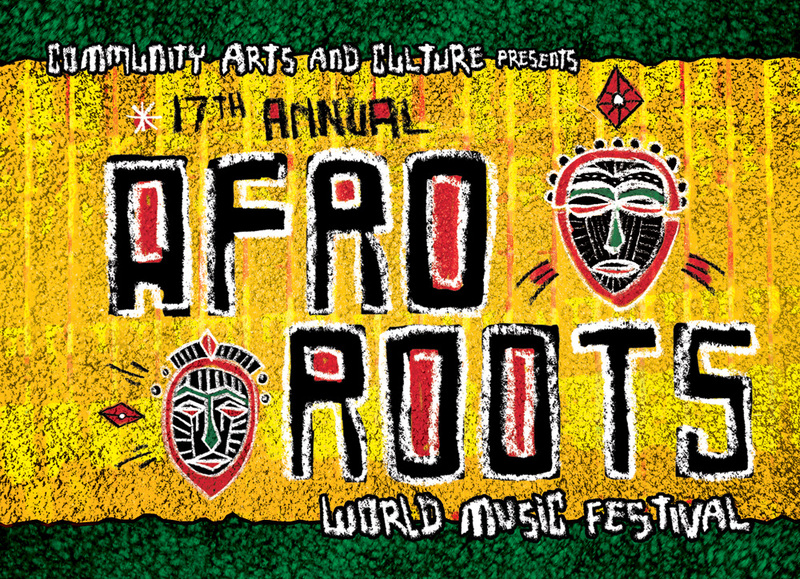 What: The 17th annual Afro Roots World Music Festival, celebrating the evolution of African culture by featuring some of the best performers from all over the Caribbean, the Americas and African countries such as Senegal, the Ivory Coast, Guinea, Mali and the Republic of Congo. Sponsorship packages available; volunteers sought. When: Thursday, August 6 through Saturday, August 8, 2015. Day 1 – Kick-Off Celebration: Blackbird Ordinary (729 SW 1st Ave, Miami, FL 33130), featuring Cortadito, Patacón Conspiracy and Global Bazaar; 9 p.m. start, free, 21 and over welcome. 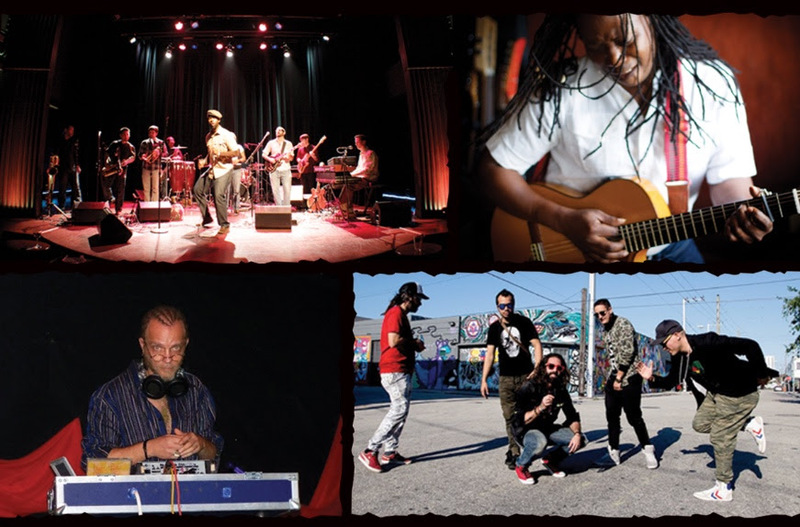 Day 2 – Global Locals Showcase: Little Haiti Cultural Center (212-260 NE 59th Terr, Miami, Florida 33137), featuring Conjunto Progreso, PALO!, Los Herederos,Morikeba Kouyate and the Nag Champayons; 5 p.m. start all-ages welcome, $15 at the door, $20 for two-day pass (includes access to Day 3 concert at North Beach Bandshell). The night also features sets by DJ Moses. The day will also feature panel discussions, lectures and workshops by some of the top professionals in the industry. Topics will focus on the business of world music and give artists an inside look into management, publishing, collecting royalties and booking tours. Day 3 – Concert at the North Beach Bandshell (501 72nd St, Miami Beach, FL 33141), featuring Hassan Houkmoun, Locos Por Juana and Bateria Unidos de Miami; all-ages welcome, $15 at the door, $20 for two-day pass (includes access to Day 2 Global Locals Showcase). The night also features sets by DJ Le Spam. A special after-party will take place at Naomi’s Garden Vibes Restaurant (650 NW 71st St, Miami, FL 33150), beginning at 10 p.m. There will be a $5 cover charge and the event is open to those 21 and over. A $10 discounted door rate is available for students and seniors with ID Days 2 and 3; kids 12 and under are free. 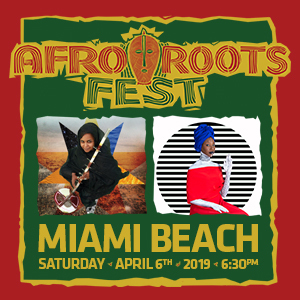 Support for the Afro Roots World Music Festival is made possible the Knight Foundation, Funding Arts Network, the Miami-Dade Department of Cultural Affairs, the Little Haiti Cultural Complex, the New Yorker Hotel and Blackwell Rum. This entry was posted in Blog and tagged afro roots, community arts and culture, live music, world music. Bookmark the permalink.